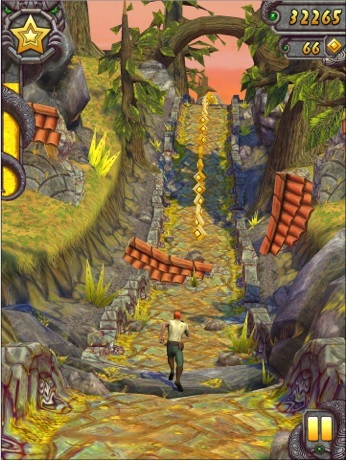 Temple Run is one of the most famous games for the Android and iOS devices, and there have been millions of downloads of the game in both the OS devices. The makers of the game have come up wit the next version named the Temple Run 2 with an entirely new concept, rather than just running on the Great wall and avoiding contact with the obstacles and avoiding falling into the ditches. The one for the iOS has come up, and the Android users should have to wait for the same. The Temple Run 2 is available for the iPhone, iPad and the iPod touch and all its generations. The actual concept of the game is still kept the same, where the main character keeps running while trying to keep itself safe from the beasts of the temple as they keep chasing and trying to end the game. The swyping of fingers to top, bottom, left and right would make the character move away from the blocking obstacles, and the concept is quite clear and easy. The game is as always, a free one to download and you would need to pay only if you wanted to have any extra add-on powers and coin doublers inside the game, using the In-app purchase feature. 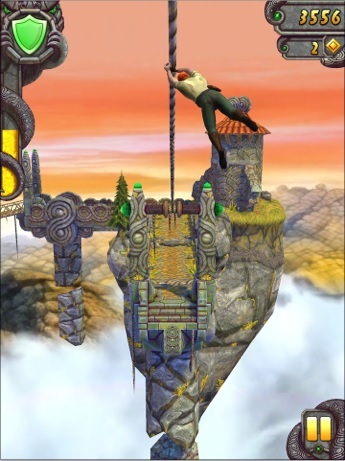 More than 100 million downloads were recorded for the first temple run game, and after the first appearance on the New Zealand iTunes Store, the Temple Run 2 is now available worldwide for free. There are a lot of new graphics, new obstacles and several powerups and achievements that one can get in the new version of the game. For every new character in the game, there are its own special powers one can earn and use, so its going to be a lot of fun, just like it has always been with the Angry Birds game and its newer versions. This game is compatible with the iPhone 3GS, iPhone 4, iPhone 4S, iPhone 5, iPod touch (3rd generation), iPod touch (4th generation), iPod touch (5th generation) and iPad. Requires iOS 4.2 or later. This app is optimized for iPhone 5 and its new display. The game is optimized differently for the smaller and bigger screens, and there is no enlarging required for the iPad as the developers Imangi Studios have made a larger screen version of the game available for the iPad and iPad Mini. How to download the Temple Run 2 for iOS devices: You need to click here for the iTunes store page of the game, and from there you can download the game for which you would need to have an Apple ID registered.